We're proud to be the Official Credit Union of UTSA Roadrunners. Like UTSA, we combine experience and education, sharing our expertise and financial know-how with a new generation of members. Credit Human supports the efforts of UTSA to become a Top Tier university through its academic, athletic and alumni programs. All UTSA students, faculty, members of the Alumni Association and their immediate families are eligible for Credit Human membership. 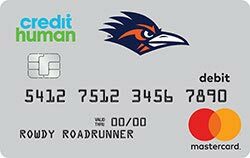 All Credit Human checking accounts include a debit card, and members can choose a UTSA card design – exclusively from Credit Human. Access funds at ATMs, including Credit Human ATMs in the San Antonio and Houston areas, and make purchases anywhere you see the Mastercard® logo. The UTSA Rewards Debit Card is available at any Credit Human location or when opening an account online. 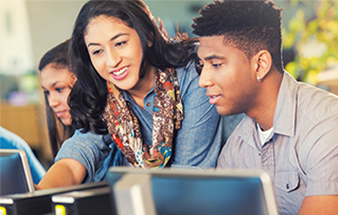 At Credit Human, it’s our purpose to improve the lives of our members. We understand that people want—and deserve—sensible conversations about their financial health, as well as simple tools to help them plan, save and borrow responsibly. We help our members make smart financial decisions that allow them to feel secure today while planning for tomorrow. Membership in our credit union has a direct, meaningful impact on our local communities. plus an exclusive UTSA debit card.